As another year comes to a close, Christine and I want to take this time to wish everyone a happy holiday season. Whether your year was full of celebratory cheers or difficult challenges, we hope you are able to take some time to relax, reflect, and be with your loved ones during the coming days, preferably over a good meal and/or a great spirit. Feeling very fortunate to work with so many positive and engaging people in an industry that we truly love, we look forward to putting this old year behind us and to setting our sights on 2019, with potentially new products, opening new markets and making new friends. Peace on earth and good will to you. Read more here. 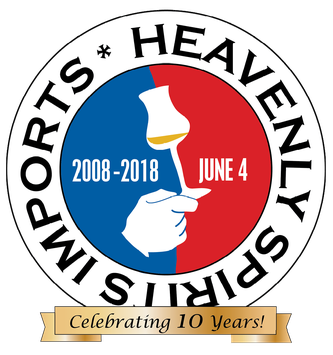 On June 4th, we marked the 10th anniversary of Heavenly Spirits, LLC. 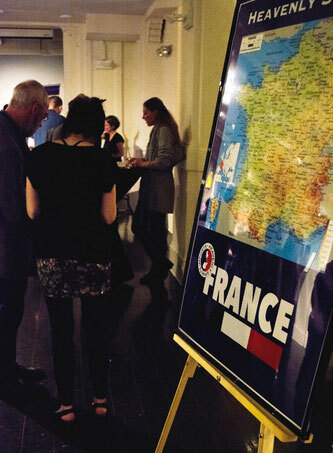 When we started in 2008, our goal was to build an import and distribution company that introduced American adult consumers to what we believe are the absolute best spirits France has to offer. 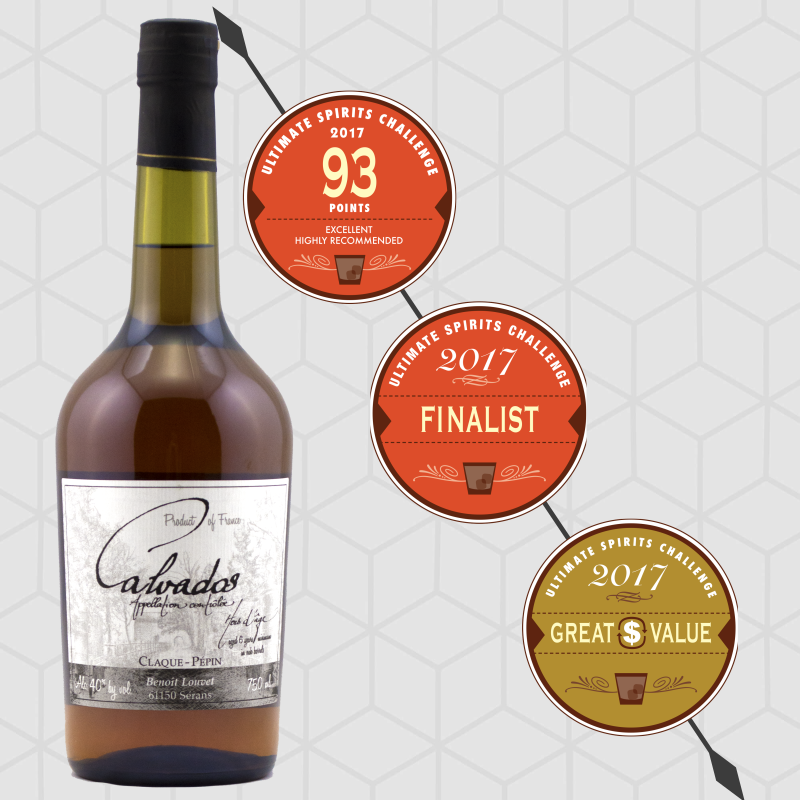 We had the pleasure of getting to know some of these multi-generational, family-owned producers when we lived in the Cognac region of France between 1994 and 1999. 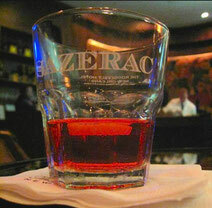 They truly represent the authentic tradition of European craft distilling. Read the whole story and many more, plus view our new newsletter layout here. We've had a busy year so far. 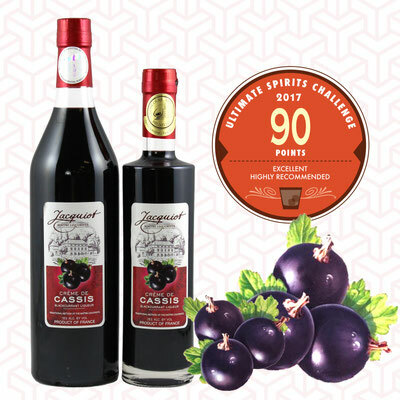 One of our Cognacs broke a Guinness World Record, our spirits swept 2 categories in the Ultimate Beverage Challenge, along with a plethora of other awards, we've traveled, brought in a new very special vintage, got featured in a Titanic-themed cocktail (left), and one of our producers even broke ground on a new warehouse. Curious yet? Read all about it, plus Dan and Christine's Seven Best Tasting Practices, here. 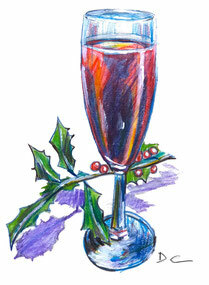 With the Winter Holidays almost upon us, we thought it might be a good time to catch up with recent events and share some new rave product reviews, as well as a few holiday cocktail recipes. 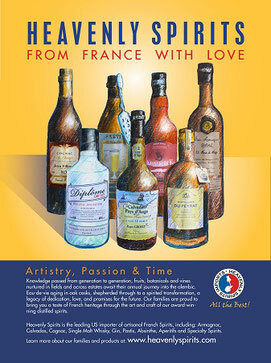 Many thanks to all who have supported our efforts throughout the year in bringing you the best artisanal French spirits available. And thank you to our producers for not only continuing to carry on those family traditions of quality and craft, but to many of you for hosting the Heavenly Spirits team this past summer during our spirit tour. Christine and I can honestly say that it was one of the most enjoyable and educational experiences in our company's history. Read more. Artistry, Passion, and Time: this is what every Heavenly Spirits supplier puts into their products. During this past June of 2017, Christine, four members of our sales team, and I had the pleasure of visiting with these twelve exceptional, family-run spirit businesses to get an in-depth look at how they do what they do. We started the tour in Normandy, visiting with Calvados Roger Groult and Calvados Claque-Pepin respectively. Nine days later we finished our tour in the Gascony region with visits to Armagnac Artez, Dartigalongue and Delord. In-between, we visited with the makers of ArmoriK Single Malt, Jahiot liqueurs, and Domaine Magnaut, as well as Cognacs houses Normandin-Mercier, Jean Fillioux, and Du Peyrat. Plus, there were several other surprising stops along the way. Also, new states, new products, news reviews, where to stay in Gascony, and how we became official Musketeers! Read all about it. 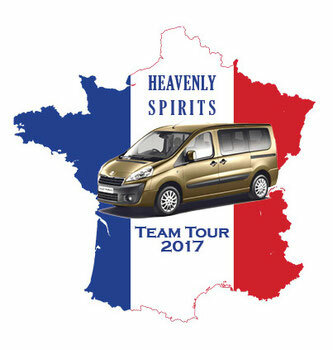 Direct link to Heavenly Team tour roundup. 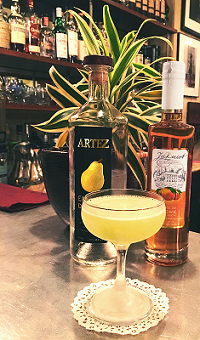 Read more, including summer cocktails; tastings and travels galore; new labels, logos and products; and awards updates. 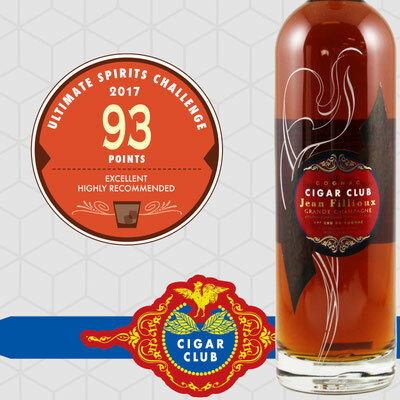 The fine artisanally-made products from the Heavenly Spirits portfolio once again collected their fair share of awards at the prestigious Ultimate Spirits Challenge this year. Of the seven products we submitted, all scored above 90 points, three were named as finalists and two took home the top prize in their category, winning the Chairman's Trophy. Leading the way with a near perfect score of 97 was Armagnac Dartigalongue 25 Year Old Grande Eau-de-Vie. Right behind that, with 96 points and another category-topping Chairman's Trophy was Calvados Roger Groult XO. 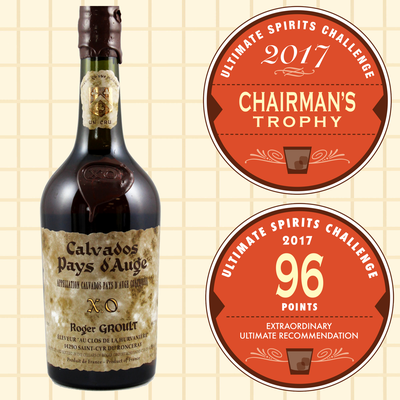 This thirty year old aged Calvados from the Pays d'Auge is a personal favorite of ours, so it is great to see the recognition so well placed. When I walked into the office this morning, I saw Christine jumping in her seat and pumping her fist, that's when I knew the numbers were in. 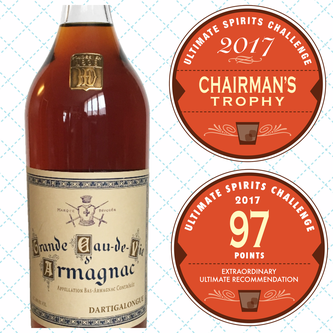 Every February, the BNIA, Armagnac's official governing body puts out the numbers for the previous year's sales of Armagnac worldwide, and once again Heavenly Spirits was leading the way for importing Armagnac to the USA. 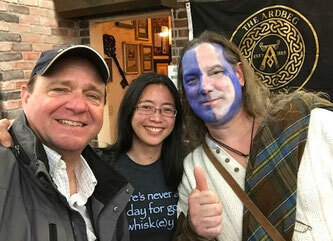 Read more about our travels, new products, Calvados and Armagnac sales in the U.S., cocktail recipes, Braveheart, and even a birth announcement! It is hard to believe how quickly these last few months flew by and that 2017 is just around the corner. We at Heavenly Spirits would like to thank all our friends, including our suppliers, distributors, retailers and customers for the continued support which has helped us add significant growth to the company again this year. In this Holiday edition of Info Splash we recap our first ever full portfolio tasting, as well as recent travels to NH, IL, & NY, along with shared cocktail recipes, new press, and gift ideas for the holidays and beyond. We had quite a busy summer here at Heavenly Spirits. Now we're looking ahead to the Fall and Winter seasons with eager anticipation. 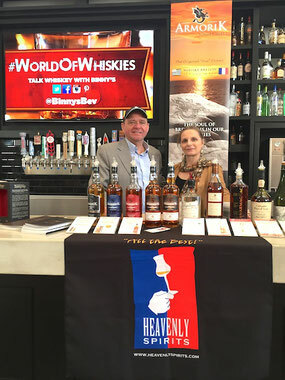 We have a lot of travel plans in the next few months, as we'll be out visiting with more of our distributor teams throughout the U.S.
Heavenly Spirits is pleased to announce a first in the whisky market: a French whisky double matured in refill ex-bourbon casks and ex-Armagnac barrels. 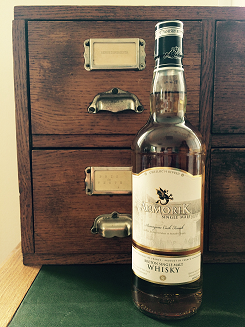 This is the first whisky in the world that we know of to have an Armagnac cask maturation. The cask used (No. 8151) came from the oldest Bas Armagnac producing house, Armagnac Dartigalongue, who happens to be another proud member of the Heavenly Spirits portfolio team. Read the whole issue. In this issue you'll find: summer travels in France and Iceland, a Cognac vs. Armagnac Master Class in D.C., new distributor and team news, a New Orleans-themed cocktail recipe, and producer updates. We don't usually send out our Info Splash newsletter so soon after the last one, but we have a bit of good news to share and it couldn't wait. 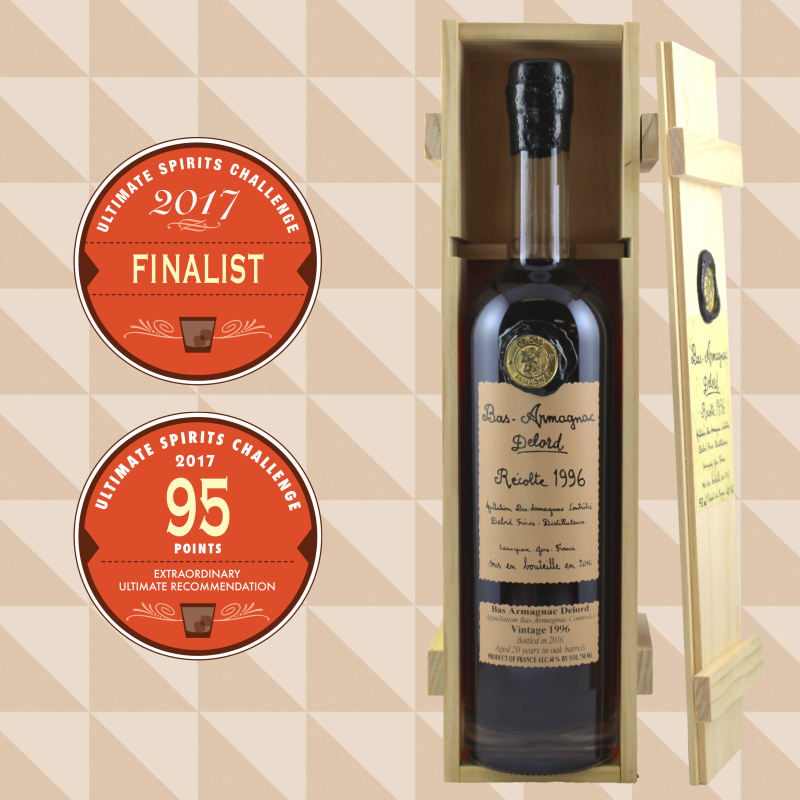 Today we talk about: New French Whisky, New Awards for our Products, Artez Arvani Vanilla Armagnac Liqueur and Recent Travels. Wishing you all a very spirited Summer! 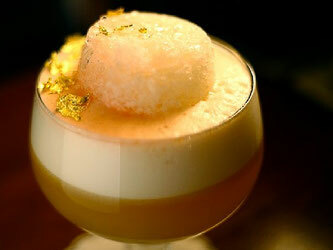 "Pear and Apple Brandies are common in Normandy and this drink has a strong underlying pear taste. To me, it's in the style of a Daiquiri with some other vegetal elements. So I thought why not a Normandy Daiquiri!" Read all our news and get the full recipe here. As much as we love talking about the exceptional French spirits that we represent, we love it even more when other people are talking about them. 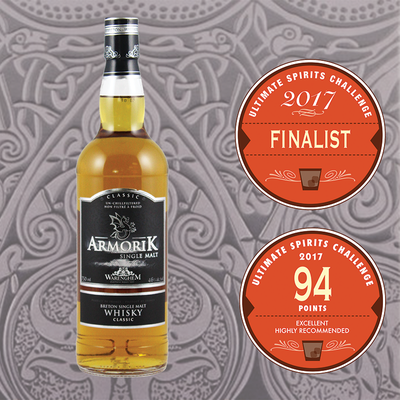 In this Spring Edition we share all the recent press regarding some of our exceptional spirit brands, as well as the awards and recognitions these fine products have earned so far this year. In addition we share a few photos from our recent travels. Read more. As most of you know, we take our product sourcing very seriously. In the case of Rhum, we have been actively seeking to discover the best quality Agricole Rhum available to add to our portfolio for U.S. representation. 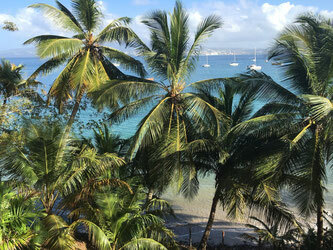 With that goal in mind we traveled to the French island of Martinique for a week of research and development. We had an amazing time! It was the beginning of harvest season and we were able to visit five of the seven distilleries on the island as well as several historic museums. We spent four full hours at one of these amazing distilleries and it was the highlight of our week, as we learned a great deal about the Martinique Rhum industry and tasted many fine spirits. Read more. Our busy season is officially in high gear and our bags are perpetually ready for visits around the country. We've already been to Atlanta, Georgia to visit with Quality Wines & Spirits, where we participated in their annual grand tasting event. Here we made a very well-received launch for Cognac Jean Fillioux. We expect this tremendous line of Grande Champagne cognacs will soon be the leading cognac for the Quality portfolio. Please see our website Blog for more photos from these and other travels. Read more of Edition #12, October, 2015. We are back from our working vacation in France and now realize almost none of it was vacation. It’s a good thing we enjoy our work. During our four weeks there we discovered some very exciting new products and got to meet the impressive artists who create these products. In short, we managed to get a fair amount of work done. #1 in Armagnac 4th Year in a Row! We are very pleased to announce that according to BNIA statistics for 2014, Heavenly Spirits has sold more Armagnac than any other importer in the US, accounting for 21% of all Armagnac sold here. Up 40% from 2013, this is the fourth year in a row we have posted double digit growth in the Armagnac category. Heavenly Spirits is experiencing growth as a company, and as we begin what promises to be our busiest spirit season ever, we are happy to welcome two new associates to the Heavenly Spirits team who will be helping us with the work flow. 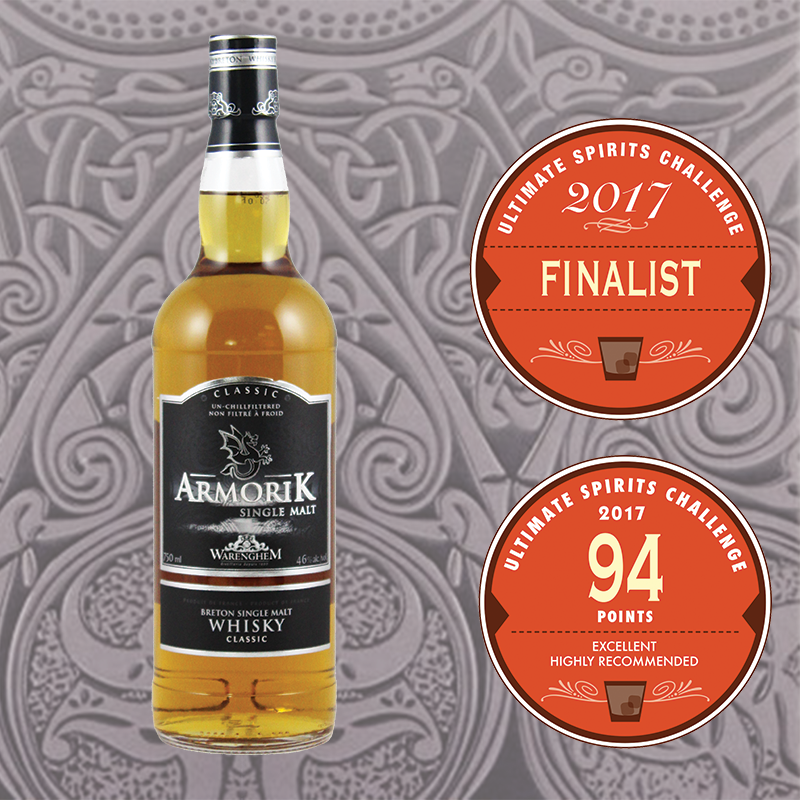 Armorik Breton Single Malt Begins 2014 by Earning Some Keen Awards! A mid-winter visit to some of our producers at their distilleries in France has just been completed and by all accounts the journey was a success. 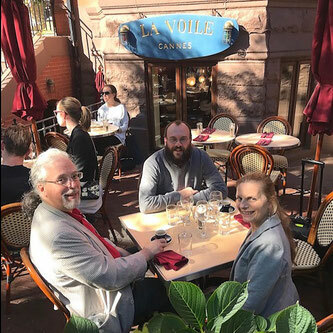 The primary goal of this tour was to meet with our suppliers and provide a few of our top US clients a first-hand look at how some of the products in our portfolio are made while providing a chance to meet the people who are making them.